It is not often that a plant in bloom makes headlines, but that is precisely what happened last week when another corpse flower bloomed at Missouri Botanical Garden. Amorphophallus titanum, commonly known as titan arum or corpse flower, is a rare species, both in cultivation and in the wild. It also rarely flowers, and when it does, the bloom only lasts for a few short days. It has the largest known unbranched inflorescence, and its flowers give off the scent of rotting flesh. For all these reasons, it is understandable why a blooming corpse flower might make the news. Titan arums naturally occur in the western portion of an Indonesian island called Sumatra. Their future is threatened because they occur in rainforests that are currently being deforested for timber and palm oil production. Deforestation is also threatening the survival of the rhinoceros hornbill, a bird that is an important seed distributor of titan arums. Today there are a few hundred titan arums in cultivation in botanical gardens throughout the world. They are a difficult species to cultivate, but their presence in botanical gardens is important in order to learn more about them and to help educate the public about conservation efforts. Titan arums are in the arum family (Araceae), a family that consists of around 107 genera including Caladium (elephant ears), Arisaema (jack-in-the-pulpits), and Wolffia (duckweeds), a genus that wins the records for smallest flowering plant and smallest fruit. Titan arums are famous for their giant inflorescence, which can reach more than 10 feet tall. The flowering stalk is known botanically as a spadix, a fleshy stem in the shape of a spike that is covered with small flowers. The spadix of titan arums are wrapped with a leaf-like sheath called a spathe. Upon blooming, the temperature inside the spathe rises and the flowers begin to release a very foul odor, similar to the smell of rotting flesh. This attracts pollinating insects such as carrion beetles, sweat bees, and flesh flies, which get trapped inside the sheath and covered with pollen. After a few hours the top of the spadix begins to wither, allowing the insects to escape, off to pollinate a neighboring corpse flower [the spadix includes male and female flowers, which mature at different times in order to prevent self-pollination]. 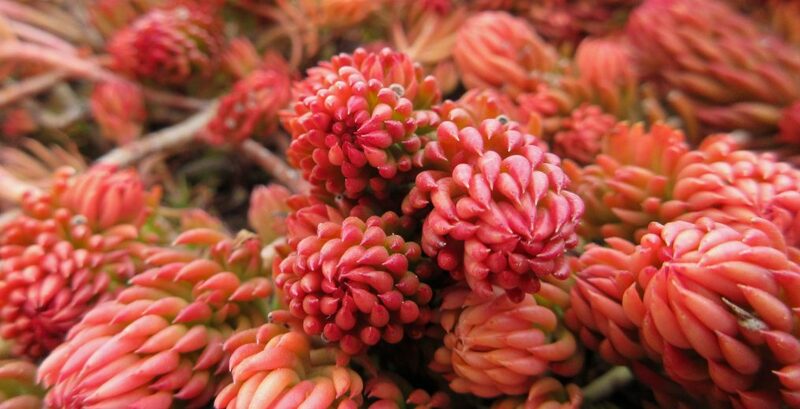 Once pollinated, the flowers begin to form small red fruits which are eaten by birds. The seeds are then dispersed in their droppings. The large, stinky inflorescence is not the only structure that gives titan arums their fame. They are also known for their massive single leaf, which can reach up to 20 feet tall and 15 feet wide, the size of a large shrub or small tree. All of this growth is produced from an enormous underground storage organ called a corm. The corms of mature titan arums typically weigh more than 100 pounds, with some known to weigh more than 200 pounds. Titan arums bloom only after the corms have reached a mature size, which takes from seven to ten years. After that they bloom about once a year or once every other year, depending on when the corm has accumulated enough nutrients to support the giant flowering structure. 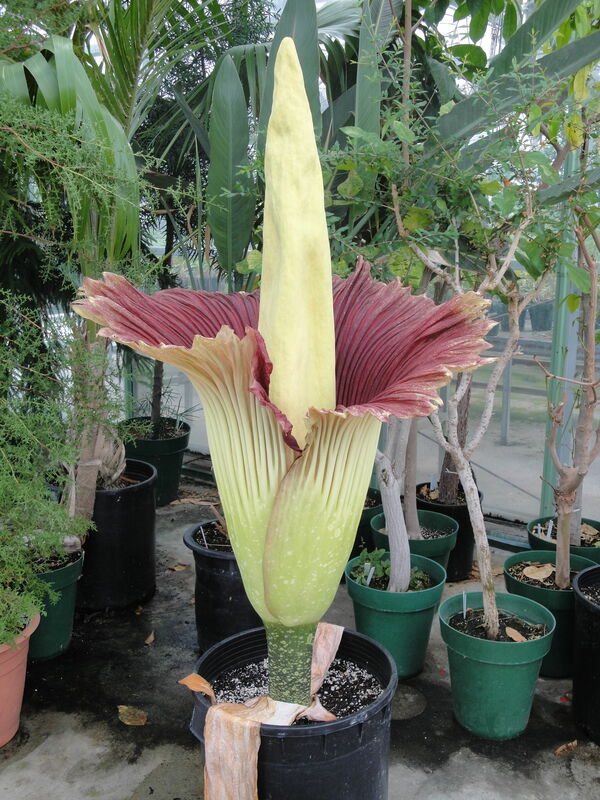 Below are two time lapse videos of titan arums in bloom. The first is from Missouri Botanical Garden, and the second is from United States Botanic Garden. Do you like what you see here? If so, please share Awkward Botany with your friends. Use any form of social media you favor. Or just tell someone in person…the old fashioned way. However you do it, please help me spread the word. Awkward Botany: for the phyto-curiosity in all of us. This entry was posted in Botany, Horticulture and Agriculture and tagged blooms, botanical garden, conservation, corpse flower, horticulture, insects, news, plants, pollination, pollinators, titan arum, video. Bookmark the permalink.